Colin Kaepernick Is Scrubbed From Song In Madden NFL 19 In 'Unfortunate Mistake' Madden NFL 19 plays a version of the song "Big Bank" that goes quiet for a moment as if censored. But the missing phrase isn't an obscenity: It's the name of the player who began a protest movement. Colin Kaepernick (left) kneels alongside teammate Eric Reid during the national anthem before a game in 2016. Kaepernick initiated a series of protests against police brutality that continue to roil the NFL. Only, the missing element wasn't an obscenity: It was Colin Kaepernick's name. Listener Jean Clervil posted proof Thursday on Twitter, playing a lyric that was originally recorded as: "You boys all cap, I'm more Colin Kaepernick." 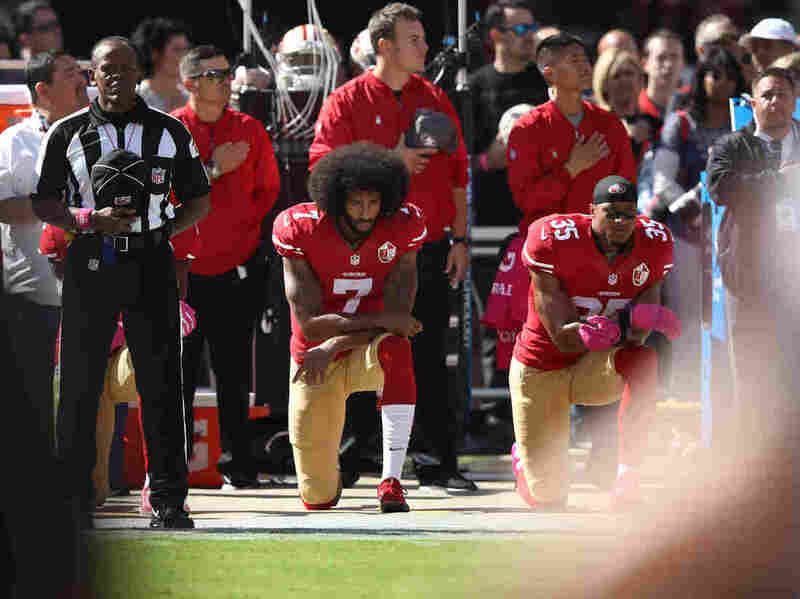 The former San Francisco 49ers quarterback has become a flashpoint for controversy after catalyzing a protest movement among NFL players. Beginning in 2016, Kaepernick sat — then began kneeling — during the national anthem before games, explaining that his gesture was one of protest against police brutality against people of color in the U.S.
Other pro football players followed his lead, swelling the ranks of silent protesters while fans and onlookers, including President Trump, erupted into heated arguments over the merits of the action. In the meantime, Kaepernick, who led the 49ers to the Super Bowl in 2013, has effectively fallen out of the league as no team has been willing to sign him. Kaepernick alleges that teams have been colluding to keep him out of the league. Now, he is out of a popular song played in a popular gaming franchise, too. And the artists behind the song are not happy about it, with YG demanding an apology and Big Sean calling the move "disappointing and appalling." "Nobody from my team approved any of this," Big Sean added Thursday. EA Sports, the division of Electronic Arts behind the Madden series, says the company did not intend to approve the edit either, calling the decision "an unfortunate mistake" less than 24 hours after it caught fire on social media. "Members of our team misunderstood the fact that while we don't have rights to include Colin Kaepernick in the game, this doesn't affect soundtracks," EA Sports explained in a statement late Thursday night. "We messed up, and the edit never should have happened." The company also promised to release an update on Monday, several days before the game's wide release, "that will include the reference again." And it apologized directly to Kaepernick, YG and Big Sean. The apology has not satisfied Kaepernick's girlfriend, radio host Nessa Diab, who pointed out after the statement's release that this is the second time his name has been scrubbed from a Madden soundtrack. As The Washington Post reports, and as another person demonstrated on Twitter, Madden NFL 18's version of Mike WiLL Made-It's "Bars of Soap" is quietly missing its originally recorded reference to Kaepernick, too. "Don't try to LIE to us and say this is a 'mistake,' " she tweeted.